Rochester Hotel 726 East 2nd Ave. Roll ebikes are the perfect way to take a guided or self-guided tour around Durango, out to Lake Nighthorse, Trimble Hot Springs, James Ranch or up to Fort Lewis College. When you rent an ebike Roll will deliver it to your door within 10 miles of Durango or to the Rochester Hotel | 726 East 2nd Ave. Roll offers 2, 4, and 8 hour + discounted multi-day and weekly rentals. Our selection of ebikes, such as Tandem, Interceptor’s and e-Cruisers, will get your vacation started off the right way: relaxing and exploring a gorgeous mountain town! No sweat, just big smiles. Roll ebikes are all about connecting people to a unique outdoor experience in our beautiful town of Durango. At Roll, we are inspired by unplugged moments with family and friends. 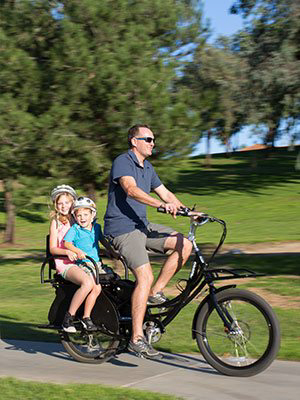 Roll ebikes make a family fun adventure possible for all ages and abilities. Tandems are perfect for kids age 10+ with a parent. Roll is constantly improving and innovating better ways to experience our great outdoors while dedicating ourselves to a more sustainable way of doing business. Our unique ebikes are powered by solar electricity, so you can take advantage of our sunny state of Colorado while cruising around town. Whether you're walking, jogging, or riding a bike, there's no better way to see the City of Durango than from the Animas River Trail. At over 7 miles in continuous length, the trail runs from E. 29th Street to Dallabetta Park south of the Wal-Mart. Throughout your journey you'll cruise along the scenic Animas River, seeing wildlife, rafting, fishermen, and more. For more tips and itineraries about how to visit Durango like a local this upcoming season, click here.